In the 25 year long wake now of three other novels and dozens of interviews, essays, translations, and critical readings of her work, much remains to say about Gail Scott's first and very Montréal novel, including a discussion of how she manages to get out of her 'bathtub' and actually start writing her long promised novel, which is to say, where does that practice of writing being dramatized here come from, what do we stand to learn about learning from that moment late in the narrative, and what has all this to do with the logic and time of addiction embedded in the pun of the title and the series of cracks that chart its 'progress'? Also, what do Jacques Cartier and the Sieur de Maisonneuve have to do with any of this? 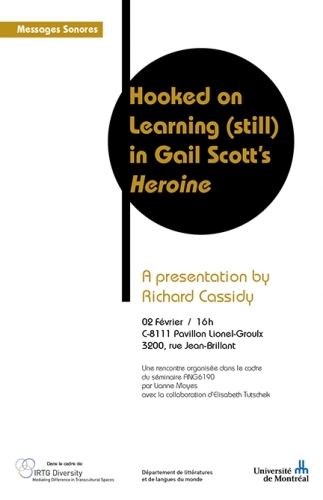 « Hooked on learning (still) in Gail Scott’s Heroine » continue la série d'événements « Messages sonores » présentée dans le cadre du Groupe international de formation à la recherche (IRTG) Diversity. L’invité, Richard Cassidy (SeoWon University, South Korea, Department of English Education), donnera sa conférence en anglais; il sera présenté par Lianne Moyes (Département de littératures et de langues du monde).